The BTG-6-BE green laser pointer is our engraved economy & "budget" model. Includes an IR filter for eye and office safety. Pocket size (134mm) for easy carry: great for presentations & briefings. Personalize with text! Gun metal carry case; black finish. Upgrade to the premium hardwood case for that special gift or occasion! 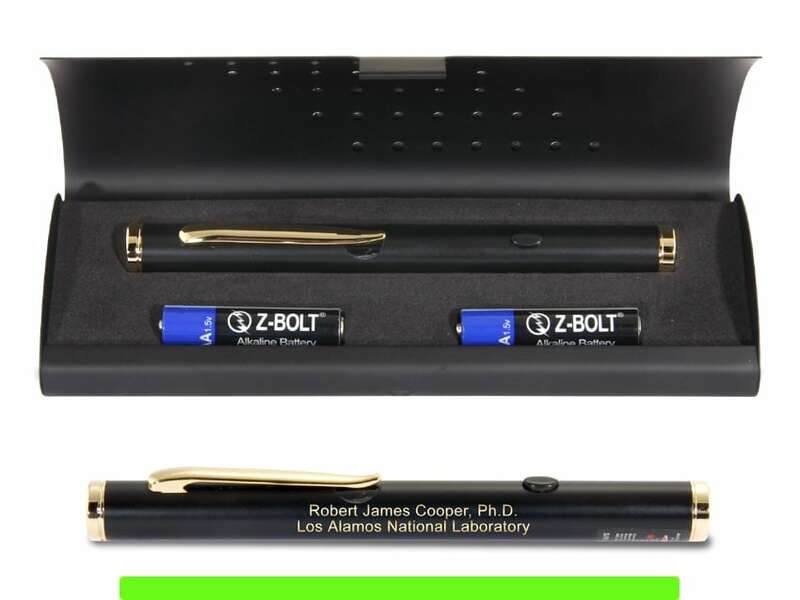 The Z-Bolt® BTG-6-BE engraved green laser pointer is our lowest priced model. Pocket size (134mm) for easy carry - great for presentations, briefings, general use. The BTG-6-BE ships in a gun metal travel & carry case and includes 2 pcs AAA batteries. Or upgrade to a premium stained hardwood case for that special gift. 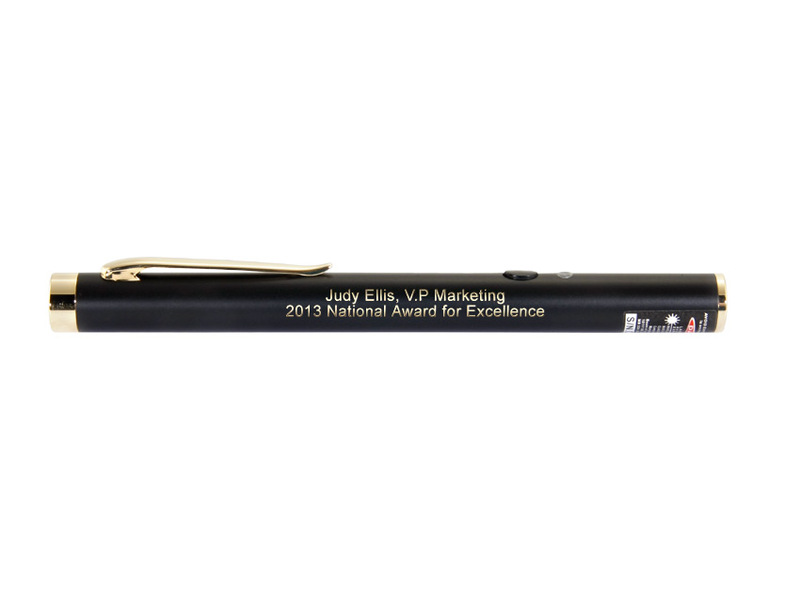 Matte black tube casing (engraves vibrant gold) Best choice when highest power not required. The BTG-6-BE green laser diode features computerized APC circuitry and includes an IR filter for eye and office safety. The computerized APC diode drive circuit features "Automatic Power Control". The APC circuit is based on a photo diode feedback loop. The photo diode monitors the optical output and provides a control signal for the laser diode, helping to maintain the diode operation at a constant optical output level. The circuit adds to the lifetime of the laser, prevents overheating, and provides overall power output stability & efficiency. Choose "Select Options" to enter engraved text online. Engrave one (1) or two (2) lines - 25 characters per line, including spaces. Choose Standard or Rush Order (24-48 hrs) Then add your delivery deadline. We accept all major credit cards - also Paypal Checkout, Paypal Credit, and Amazon Pay. Or choose "Call in Credit Card #" for added security (reference Invoice # received after checkout) Buy with Confidence! 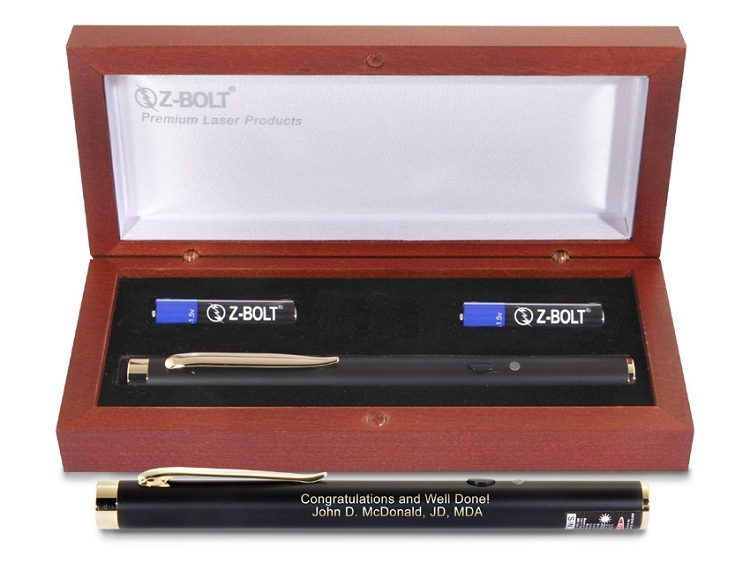 Z-Bolt® offers lightning quick processing on all engraved laser orders. (3 to 5 days turnaround standard - pick "Rush Order" for 1 to 2 day expedited production) No set up fees or order minimums. Our default font is Arial. 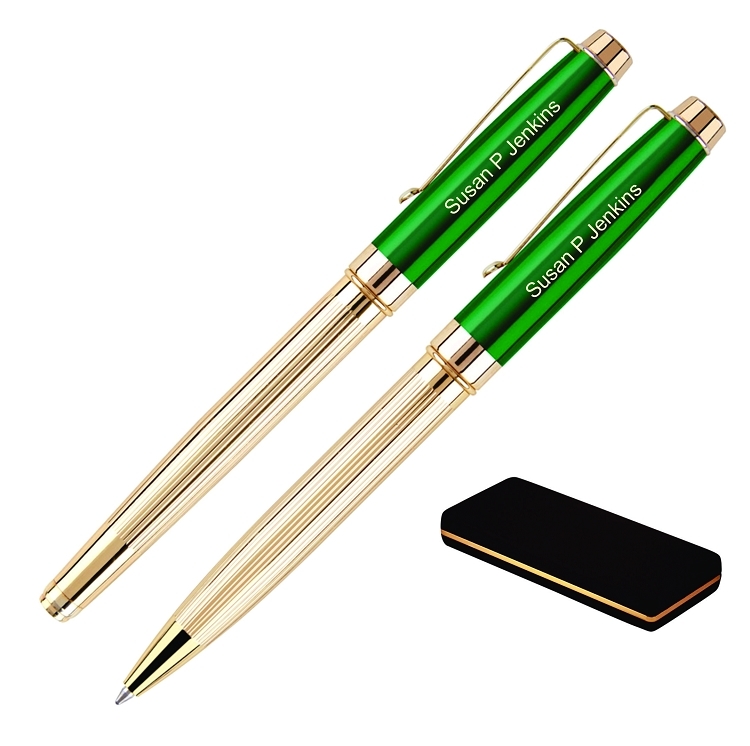 We can also engrave corporate, government, school or team logos, etc. An email proof image provided for large or complex orders. (Upon Request) Feel free to email order questions and/or transmit logo art files to karen@z-bolt.com (10 pc Min for Logo Art) Best logo formats are 600 dpi .tiff, .eps, or .ai. ( We can work with others ....) .eps and .ai files need to be saved in PC format, not MAC. 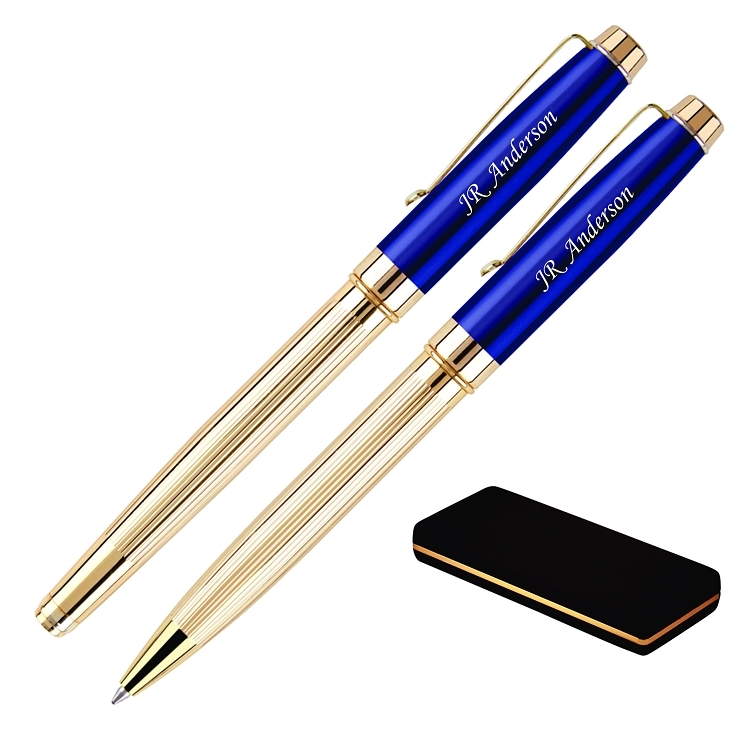 Add an 18kt Gold plated metal ballpoint click pen and rollerball with jumbo black ink cartridge in both pens. 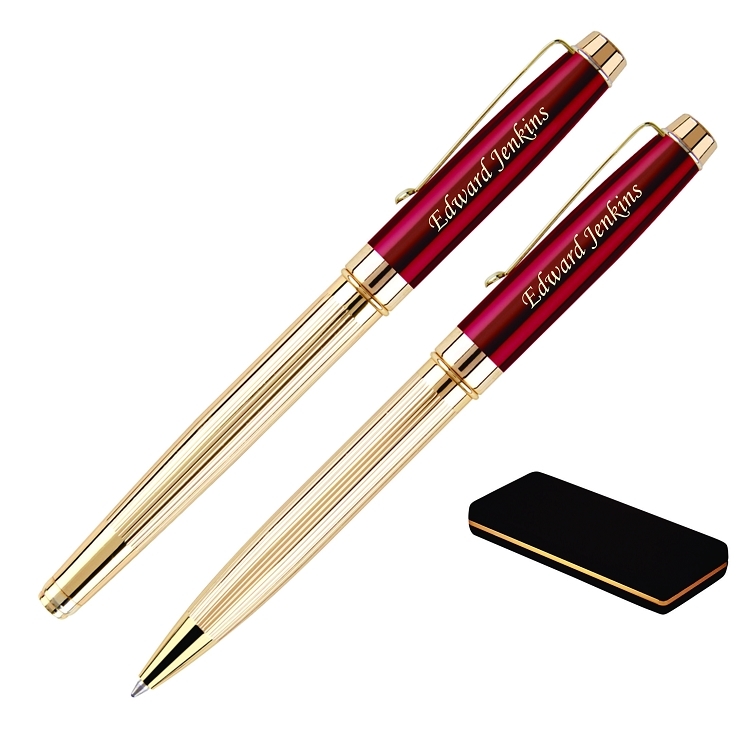 This pen set comes with a free deluxe gift box and laser custom engraving / personalization. Laser engraving shows up gold, see images. Choice of Green; Blue; Red pen set finishes.